I am very pleased to have this article on theory development published in ANS. Theory development is an integral but infrequently accomplished process in grounded theory research. It takes time…time that is generally not going to be supported by research funds, at least not at the NIH level. For a grounded theorist one of the interesting things about theory development is considering the impact of context. In the group of young women interviewed for this study, the influence of family history quickly became apparent in their level of skepticism over the negative result of the BRCA test. Most of them initially stated that they simply didn’t believe the results. Their perception of their risk for future breast cancer development was grounded firmly in their family’s experiences around breast cancer and other cancers as well. While the young women who had no family history of early onset breast cancer were puzzled they were not influenced by past events and were much more likely to want to simply “move on”…to get over the treatments and get beyond the breast cancer. Those with a family history did not express this idea of “moving on” because they attributed their experience to genetics…and that moves with you. As a researcher it was encouraging and interesting to see some of the concepts developed in the first theory (Theory of Genetic Vulnerability) present in the second analysis. 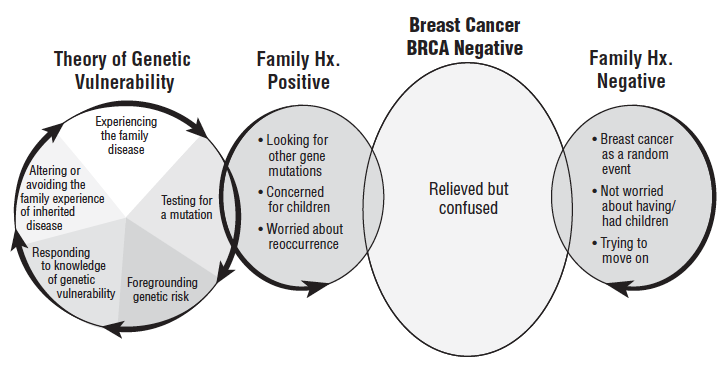 The concepts of “Experiencing the family disease”, Testing for a mutation” , and “Foregrounding inherited genetic risk” were also present with the participants that had a family history of breast cancer while only “Testing for a mutation” was evident in those without a family history. The clinical implications of this is that a nurse must realize that the “facts” that are presented to someone when faced with genetic testing must blend well enough with the family history or it will largely be discounted or at least perceived as not particularly relevant to the patient. I recently presented the original theory at the International Family Nurses Association in Minneapolis and received interesting and supportive comments on using a mid-range grounded theory in a family practice setting to help the RN or APN guide an assessment of a patient. It was suggested by a colleague that perhaps the most pertinent questions are not related to what brings a patient into the clinic on that day but what they perceive to be the vulnerabilities of their families. Would we get different answers about our patient’s concerns and perceptions of their own and their family’s risks? Might be an interesting conversation to have! We invite you to join the conversation here on this blog! Go to the ANS web site to download your copy of this article at no charge!